-andesine: a solid solution of albite (NaAlSi3O8) and anorthite (CaAlSi3O8), i.e. a plagioclase, with 30-50% anorthite and 50-70% albite. The QAPF diagram (left), as defined by the IUGS, classifies plutonic rocks according to the percentages of quartz (Q), alkali feldspar (A), plagioclase (P), and feldspathoid (F). 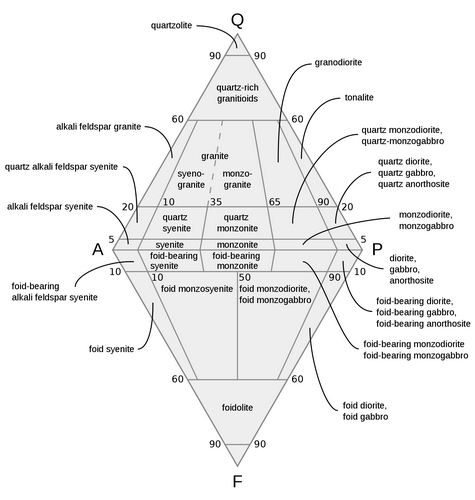 The mafic mineral content is not indicated in this diagram. Source: -xfi- (Own work) [Public domain] via Wikimedia Commons. 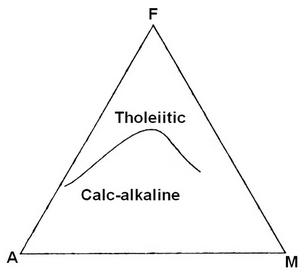 The AFM diagram (right), shows the difference between tholeiitic and calc-alkaline igneous rocks, by their relative percentages of alkalis (A = Na2O &plus; K2O), iron (F &equals; FeO &ast;, i.e. the total of all iron oxides), and magnesium (M &equals; MgO).